Dang. With Christmas time, visitors and other great things happening, I just plumb forgot the old line shack. The last time I was down by the crick, where the old line shack is, there was a teen age girl chop`n firewood for the cook stove, an old dog with three legs lay`n by a horse that was tied to the front porch. Of course there was me, sitt`n my sorrel pacer and roll`n a smoke with the make`ns. I was go`n inside, but I don`t know them folks and they sure don`t know me. I just looked around the yard where I used to play when just a wee kid. The old snapp`n turtle that almost got me when I thought it was a mountain lion. The old dog reminded me of the one we had, got caught in a trap one winter and he gnawed his leg off to get out. We pampered him for a while, but he didn`t need no help, he was just fine. Look`n out across the yard reminded me of the Christmas tree that used to grow on the far cutbank. My Mother used to see it from her kitchen window `til one day, just before Christmas my brother came drag`n it home behind his horse and put it up in the front room. 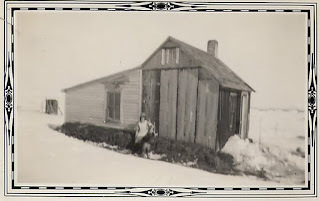 That was in the old days, when the shack was home. We used to hold the spring round up out there in the corrals. Cowboys used to rope and ride with their .44 by their side. Actually it was more than likely just a .22. The West had already been won and the gun was just used for shoot`n rattle snakes. But, it was fun times. Big bon fire with some cowpuncher smoke`n up a bunch of Mountain Oysters. Some other Honyokker strum`n an old beat up guitar. Bawlin calves be`n stripped of their masculinity, herds of cattle be`n drove in and out to the tune of yell`n, git-hah! Old Fred, the neighboring rancher who teased me unmercifully, sitt`n on a stump by the camp fire. He slapped his leg when he told a great joke, slapp`n the pocket full of stick matches he always carried. How I rolled on the ground in a fit of laughter when I saw him erupt in a mass of flames, runn`n for the crick to jump in and put out the fire. You might say, "those were the days", but you would be wrong. Them ghosts of the days and nights, old memories kinda brand a place in the mind where it flares up now and then and them ghosts come march`n `cross the pasture by the old line shack.